• My hair is a hotazzmess.com, I did a dry braidout that is an EPIC FAIL! • My Wachovia account finally converted to a Wells Fargo account over the weekend, but on today – where in thee HELL is my bill pay? • State Farm Insurance, my agent and her office help, are two seconds away from me going from Corporate to Ghetto! Why am I calling you about my $$ on the 13th and this was supposed to be handled on the 1st?! No worries, yo azz will get a visit tomorrow! • I really need to diet and exercise! I packed my breakfast & lunch today, so that’s a start! Planning to hit the elliptical when I get home! • I really need an oil change, should’ve done this over the weekend, but will try immediately after work! That’s all I got! I hope your Monday is going well! 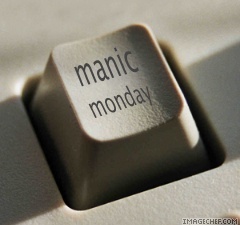 This entry was posted in Manic Monday. Bookmark the permalink.